Okay, I'm officially crazy....another challenge! I just couldn't resist. I've been seeing this one around the book blogosphere and it's just so listy! It speaks to my inner organizational self (way inner...I'm talking buried deep inside the outer layers of procrastinator self!). 1.The goal of this challenge is to read the number of books first published in a given year that corresponds to the last digit of each year in the 2000s — 10 books from 2010, 9 books from 2009, 8 books from 2008, etc. The total number of books required, therefore, is 55. 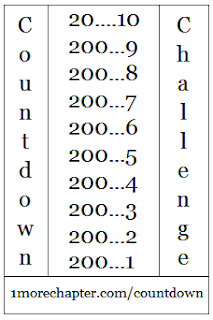 2.This challenge lasts from 9/9/09 through 10/10/10. 3.Crossovers with other challenges are allowed and your lists may change at any time. Click here to go to the site and sign up/link with Mr. Linky. I'm not going to completely fill in the list now. I'll have to come back to it. And the 2010 books I know will be filled in mostly by ARCs! Wow! You are crazy! I can't get through books as fast as most with all the things I have going on(I have a one year old!LOL) but I wish I could! These challenges look like so much fun! Good luck to you! I keep thinking I might sign up for this one, but I'm already over-challenged. I'm looking forward to seeing what goes on your list. Good luck with this challenge. I'm trying to finish up my 2009 ones right now. What a commitment! I can’t imagine tackling something like that. Good luck. So glad you decided to participate!